The New York City Police Academy (NYPA) incorporated many of the Police Department’s existing training facilities that were dispersed throughout the City of New York into one consolidated campus. The inherent design of the NYPA is meant to promote opportunities for occupant movement, as it offers simple and engaging ways that trainees as well as office staff can include physical activity throughout their day. As such, the project was granted the LEED Innovation Credit for Health through Physical Activity. The eight-story facility occupies 730,000 sq. ft. across 35 acres and holds a simulation training center that gives recruits a chance to act out real-life scenarios they’re bound to encounter in the field. The academy simulates apartment housing, routine car stops, courthouses and precincts, among other aspects of everyday police life. 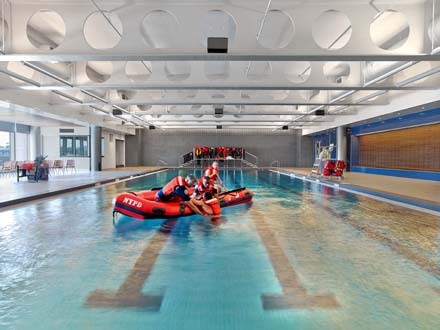 The physical training center houses an indoor track as well as a four lane, 25-yard lap pool used for scuba diving training with depths ranging from 3 ft. 6 in. to 12 ft. The facility has smaller physical training rooms to support a baton gym, CPR gym, as well as a locker room, dining space for recruits, and office space for support staff. The campus received a LEED Gold rating based on its design. Sustainable features include rainwater harvesting and reuse on site; biofiltration of storm water runoff; energy efficient lighting; green and “cool” roofs; a high-performance building envelope with solar shading and daylight harvesting; and an energy-efficient utility plant.